Total width with hinge and clasp: 3.25"
Container Size (oz. ): 2 Diameter: 2.125"
Fill container with product. Use hinge to close. COMMENTS: These little jars are exactly what I was looking for. They're adorable and perfect for my face & foot scrubs. 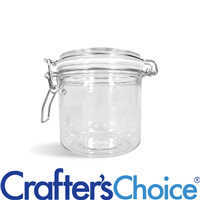 "2 oz Bail Jar and Lid Set"
COMMENTS: We use the 8 oz and 16 oz Bail Jars for our bath and beauty products. The 16 oz jar is used to package our signature Blue Springs Lavender and Basil Bath Salts. We use the 8 oz Bail Jars to package our other bath salts with botanicals, Scrubs, Exfoliants and shaving products. Recently, a client requested a custom order of several jars of our Jelly Soap and asked if we could package them in the 8 oz Bail Jars. After we finished this packaging the Jelly Soap we were soap excited about the way the product looked in the Bail Jars, decided to use the Bail Jars when we introduce our Fall and Christmas Bath Jellies this year. It's amazing how the packaging can give a completely different look to a product. COMMENTS: I did not know that Wholesales Supplies had this size. before I bought the 7oz and the 16oz. I was amazed to see the 2oz and the 4oz too! I find myself using it not only on soaps and creams but just storage around the house. As soon and I got them, I wanted them for shaving soap and creams. I have not made any of those yet and I am out of my 48 jars using them around the house for storage. I just added more to my order for my original intent of soaps and creams. 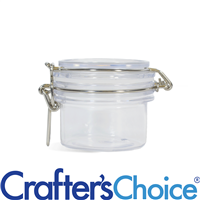 I Love to be able to see what is inside the jars, the color, they have the top attached (I don't have to be looking for the tops to see what fits) AND the tops are leak free! My house is so much organized now that I can see what I have in the jars instead of having small items! 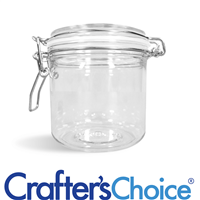 Love, Love, Love these jars! "Are these glass or plastic?" Staff Answer These are made of PET plastic. "How many of these come in a set of one? Is it just one bail jar per set of one, or are there more?" Staff Answer One set is the jar and lid. "What are the dimensions of these jars? (Height, diameter?)" Staff Answer This jar is approximately 2" high, 2.5" wide and has a 7" circumference. "Are these air tight? " Staff Answer They do have a rubber gasket which will certainly help keep these airtight.